My mum took my little boy for his first visit to the Potteries Museum and Art Gallery in Hanley today. I was so excited to hear about their visit! Apparently his favourite part was the Spitfire gallery – he had to be almost dragged away. We’ll take him again and again over the years, I’m sure. I love it there too. 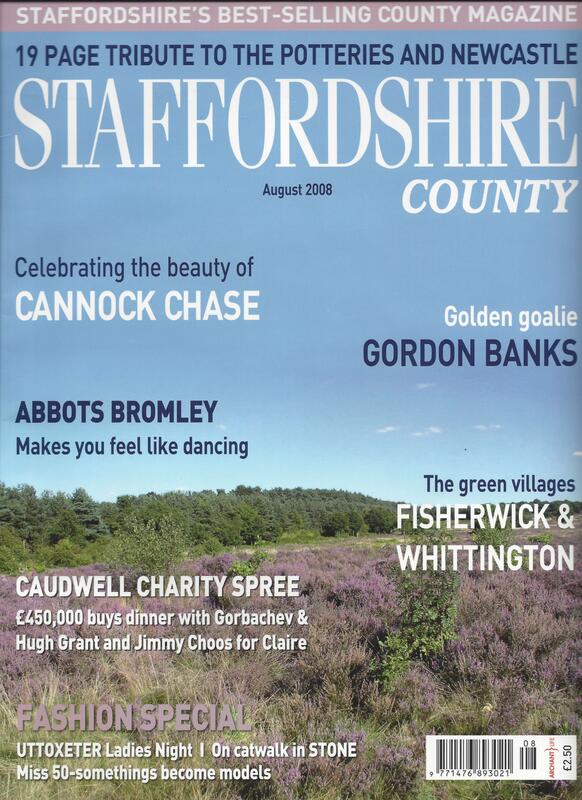 Their visit made me think of this feature that wrote for the August 2008 edition of Staffordshire County Magazine (no longer published). It was before the discovery of the Staffordshire Hoard, which now forms a key part of the museum’s exhibitions, but I expect most, if not all, of the items I mention are still there five years on. I hope they are. Hannah Hiles returns to one of her favourite childhood haunts to see whether the magic is still there 20 years on…. The Potteries Museum and Art Gallery in Hanley can be summed up for me in a few words: rabbit; skeleton; boat; cows; whippet; and plane. While they may sound like entries from an ABC book, they represent the highlights of the museum as seen through my childhood eyes – and, it turns out, my adult ones too. My parents and I used to go to the museum every Sunday. I don’t recall this routine ever being boring – I never tired of stroking the stuffed rabbit, or feeling a pleasurable shiver down my spine looking at the skeleton, or marvelling at the Spitfire, for example. But would I still feel the same all these years later? Having been given some information sheets by the very helpful staff on the reception desk, I headed straight for the natural history gallery on the ground floor. One thing that struck me straight away is that it seems like today’s children want more than to look at exhibits – they need dressing up boxes, drawing paper, stuffed toys and such like. Maybe we were easier to please 20 years ago. My late bunny friend was still there, but protected from inquisitive child-hands by a glass case, along with all sorts of other familiar and forgotten wonders. A mummified cat! A six-banded armadillo walking on tiptoes! A tarantula, a badger, boxing hares and a barn owl catching its prey! While the checked petals of the Fritillary looked as exotic as ever, I was getting so excited about getting to the archaeology section that I had to restrain myself from running straight to the skeleton. This section describes sites and finds representing 12,000 years of local settlement, and includes treasures such as gold torcs, a cup-and-ring marked stone and what is known as the Staffordshire Moorlands pan – a 2nd century AD Roman artefact currently on loan to other museums, but returning to Hanley in 2010. It is amazing – and eye-opening – to see how many historical objects have been found in Staffordshire. I was delighted to see that an old favourite, the log boat from Abbey Hulton, was still there, and that the skeleton was still grinning his toothy grin. “I’ve missed you, old chap,” I murmured under my breath. Moving on into the Community History area, the Arnold Bennett exhibits were enlightening – as well as seeing his bag and slippers, I learned he had been in charge of propaganda in France in World War One – and the Miners’ Strike memorial, carved from Hem Heath coal, was a poignant addition to the gallery. The two men in the reconstructed pub scene were still playing their interminable game of dominoes while their whippet looked on. According to the board, the dog is called Billie and “he has a special story to tell”. Dog lovers should look for the additional information sheet to find out more about brown-eyed Billie, but should make sure they have a tissue to hand. After the home scene, chemist shop, fire engine, classroom and fish and chip shop, I came to the room at the museum’s heart – the Spitfire Gallery. The plane last flew in 1952, but still looks every inch the “incredible, immortal combat vehicle”. Reading the tales of bravery of local men on the boards around the room I felt choked up in a way that my childhood self would never have imagined. I couldn’t agree more with the visitor’s comment on the wall: “You are in the presence of greatness”. Needing a little light relief after the intensity of the Spitfire Gallery, I looked in on You’re History, a gallery featuring trends from the past few decades, and popped downstairs to see the temporary exhibition about the cartoons of Dave Follows, creator of the May Un Mar Lady comic strips. I must confess that I whizzed quite quickly round the first floor, just as I used to as a child, glancing at the world-class ceramics displays (including Clarice Cliff, Minton and Wedgwood masterpieces), art gallery and Changing Fashions exhibition – but as I did as a child, I paused at the cow creamers and frog mugs, and Ozzy the Owl, a 17th-century slipware owl jug, who was “discovered” on the BBC’s Antiques Roadshow in 1990 and subsequently bought by the museum. It was also interesting to see a more recent addition to the collection, a thought-provoking Grayson Perry piece called “Video Installation” which is actually a ceramic vase, listing 10 sorts of work Perry feels have become clichés in contemporary art. Having visited the British Museum in London just the previous week, I have to say I enjoyed my trip to the Potteries Museum and Art Gallery even more. While this can be partly put down to nostalgia, I was also surprised to find just how proud it made me to be from Staffordshire, where so many amazing things have been created over many hundreds of years. I wrote about my love of the Potteries Museum and Art Gallery in Hanley as part of the August 2008 Newcastle-under-Lyme and Stoke-on-Trent county special for Staffordshire County Magazine. View a PDF of my feature about the Potteries Museum and Art Gallery, Treasured Memories, here. This article also appears in full on my website here. 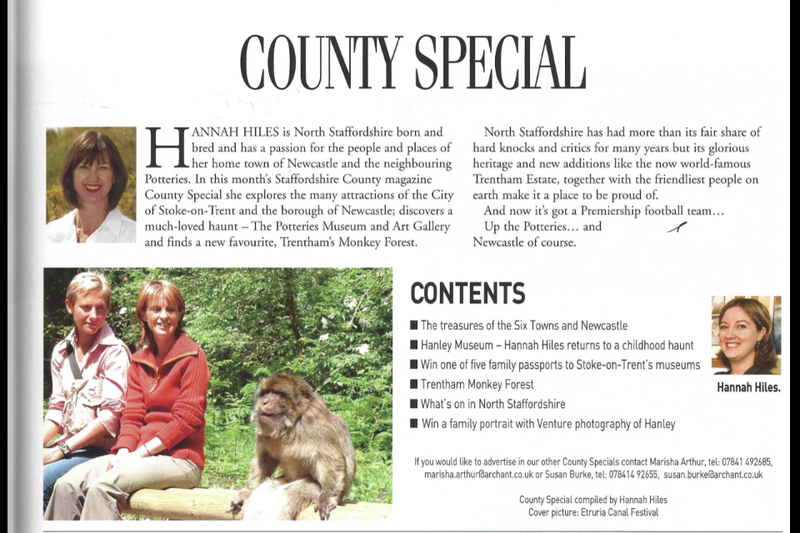 I wrote a pull-out about Newcastle-under-Lyme (my home town) and Stoke-on-Trent for the August 2008 edition of Staffordshire County Magazine. View a PDF of the Newcastle-under-Lyme and Stoke-on-Trent guide, Northern Highlights, here.